A small cigar, created in line with the rest of the original Cohiba Linea Classica. Intensely rich in bean flavor, but packaged with a light tobacco aroma giving the impression of a mild fresh smoke. The cigar will need to heat up to get smooth draw, but once the cigar is on the go, it will be direct and fast paced. Be careful not to get carried away and smoke too quickly. First of all, remember this is a true Cuban Cohiba. These cigars are ideal for traveling. 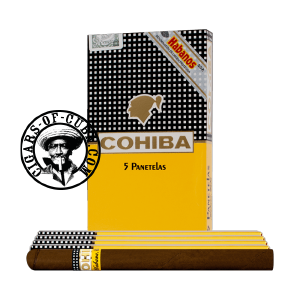 Whilst you are waiting for boarding and you have only 10 or 15 minutes, instead of lighting up a larger shape, take a Cohiba Panetela! Familiar Cohiba beany aromas with a mild tobacco back drop. It's all bout pacing your smoke. A real Cuban finale. Intensity and power build to a strong climax.